A lot has been written about the beautiful hill stations in the state of Himachal Pradesh and due to my current personal obsession with the mountains, I dragged not just 1 but 6 great friends to join me on this adventure. Have you seen the movie, WILD,starring Reese Witherspoon? If so; NO I am not hooked onto this hobby to settle any uncleared debts with any demons of my past or to make peace with my life’s poor choices, it’s just to keep my sense of adventure burning and to momentarily feel like a carefree single girl. 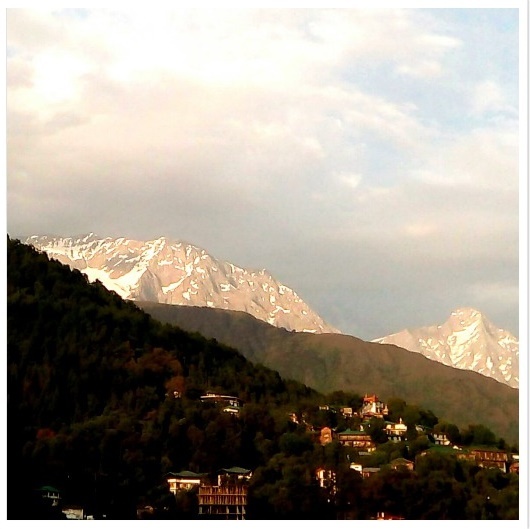 My getaway began at the town of Dharamshala which sits at 4800 feet high in the Indian Himalayas. Home to the 9 Corps of Indian Army, His Holiness the Dalai Lama, the Tibetan government in exile and quite a few travelers ;this town had a sense of warmth inviting me to stay longer. Around 4 kilometres north of Dharamshala is the commercial but quaint suburb of McLoed Ganj rightfully referred to as the Little Lhasa. At an elevation of 6800 feet,a look in every direction guarantees a stunning view of either the Kangra valley or the sheer snowy-peaked Dhauladhar, each direction pulling me towards it; closer to the breath-taking views it holds in its palms. Interspersed with Lamas dressed in red &orange there was a tranquil vibe being spread even in the traffic and chaos on the narrow one way streets.I was equally fascinated by the warm inviting cafe culture and the street art at every nook and corner. 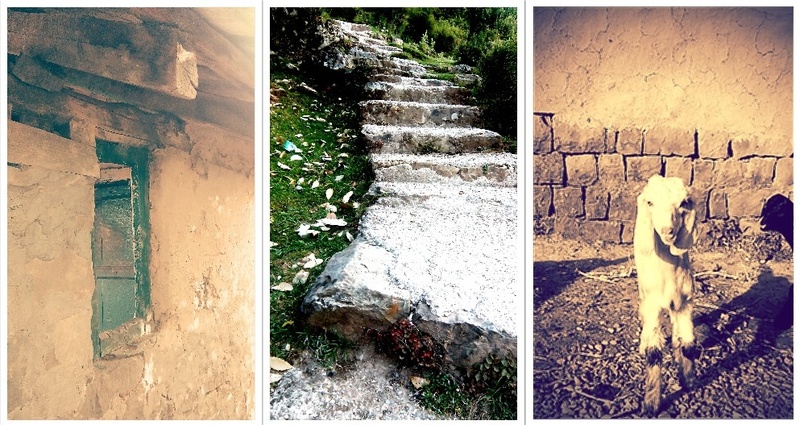 I however felt the closest to the mountains when I stumbled into the village of Naddi. Situated at a height of 7152 feet Naddi is perched high away from the hustle and bustle of McLeod Ganj and is guaranteed to detoxify you. A stroll into the village at 5:00 am reminded me of the happy simple way of life where one is awakened by the singing of birds or bleating of the goats in the valley. Every bend into this village offers you a peek at surely one of the most dramatic backdrop of the great high peaks. The local people were delightful, friendly and visibly satisfied with their humble belongings. Every local I met had this twinkle in his or her eyes curious to know where I was headed to and not understanding why a stroll in their backyard was such a joyful experience for me. 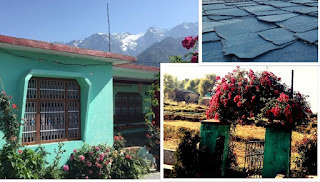 This village had its own quiet charm and a slow pace which was appealing in a very unique way. As we panted and walked through sheep sheds and village alleys, chorus of local girls’ giggles broke the serene silence, probably doubting our fitness levels to continue on the trail. The picturesque homes surrounded by terraced fields only confirm that these villagers really do live the high life because the view from their front doors is absolutely heavenly. As I started to descend back towards my to-do lists and the daily work life I could not but imagine coming back to Naddi again. Reading this made me realize that there are so many small little things in life that can give us happiness. We urban folk expect so much from life and keep chasing behind goals which may or may not fulfill those expectations. Instead may be, sometimes we should just stop, wait and look around..... A little flower in the garden can bring a smile on our face..